Super Tanzine Aura, generator pendulum on a 925 sterling silver trace chain, finished with a 10mm, 925 sterling silver filigree ball. It comes with a copy of Elizabeth Clare Prophet's book, 'Violet Flame, to Heal Body, Mind and Soul'. Tanzine Aura Quartz is created by coating Clear Quartz with a one micron thick infusion of Gold and Indium, resulting in an immensely powerful crystal. 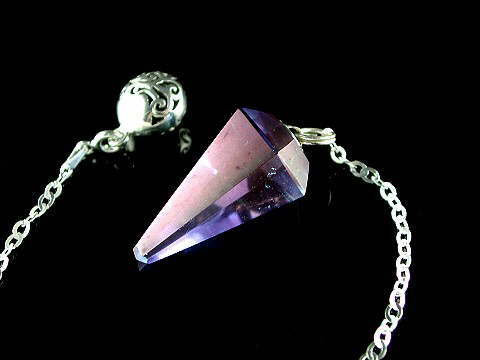 This special pendulum offers a wonderful, iridescent display of light - fusing the properties of both the Blue and Violet Rays with those of Clear Quartz. Indium was first discovered in the late 19th century but has only recently been used to create the beautiful coated Quartz we know as Tanzine. It got its name, unsurprisingly, from the bright indigo line in its spectrum. Its properties are very similar to those of Tanzanite. Although similar in appearance to Aqua Aura, it is more violet in colour and due to the infusion of the rare element, Indium, as outlined above, it has the added benefit of the beautiful energy of the Violet Ray. Governed by the Ascended Master, St Germain, the Violet Ray is the seventh ray. Just as sunlight passing through a prism splits into seven colours, so spiritual light manifests into seven rays. The energy of the 7th Ray bursts forth and burns like a violet flame, dissipating fear and darkness, inspiring the qualities of mercy, compassion, forgiveness, justice and freedom. It is said that the Violet Flame is the key to resolving and removing all karmic debt, not only for ourselves and others, but also for the planet. It comes with a copy of Elizabeth Clare Prophet's book, 'Violet Flame, to Heal Body, Mind and Soul'.